Reeve after the openin nicht o The Marriage of Figaro at the Circle in the Squerr Theatre, New York Ceety, 1985. 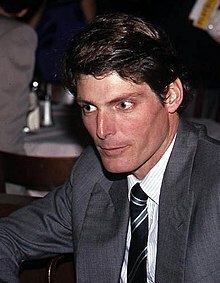 Christopher D'Olier Reeve (September 25, 1952 – October 10, 2004) wis an American actor, film director, producer, screenwriter, author, an activist. He achieved starndom for his actin achievements, in pairteecular his motion pictur portrayal o the comic beuk superhero Superman. This page wis last eeditit on 17 August 2017, at 20:03.